When you think of hallucinogens, you probably wouldn’t expect to find one lurking, unbeknownst to you, in your kitchen spice rack. However, the hallucinogenic properties of nutmeg have been known for some time – historical records mention its use as a treatment for problems with the digestive system and the kidneys, and others from as far back as the 16th & 17th centuries comment on its narcotic effects. So, what are the chemical compounds that cause this? 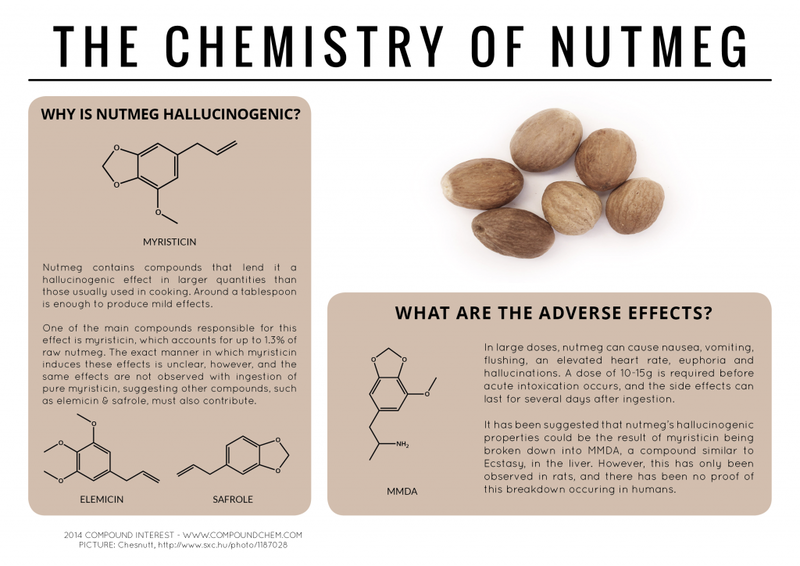 Several compounds have been implicated in the hallucinogenic effect of nutmeg. The main compound implicated is myristicin, which accounts for approximately 1.3% of raw nutmeg. It was suggested in research that the effects of nutmeg could be due to the breakdown of myristicin in the liver into MMDA, a drug of the amphetamine class and known psychedelic. However, whilst this transformation has been observed in the livers of rats, there has been no evidence of such a transformation occurring in humans. Interestingly, when a significant amount of pure myristicin was given to a group of subjects (twice the amount present in 20g of nutmeg), whilst 6 out of 10 showed some effects, they were much milder than expected in comparison to the effects of nutmeg. This suggests that the presence of other compounds in nutmeg must also be important in inducing the full ‘nutmeg effect’. Other compounds that have been suspected of contributing to the effect are elemicin and safrole. Before you reach for a spoonful of nutmeg, it’s worth noting the effects it can induce. Up to 1-2mg of nutmeg per kilogram of body weight can induce effects in the central nervous system, and anecdotal records state a tablespoon is enough to bring on some of the other effects noted. These include nausea, vomiting, flushing, elevated heart rate, euphoria, hallucinations and a dry mouth; on the face of it, not a particularly cheery band of side effects. It doesn’t really get much better – as well as some of the effects being less than pleasant, they can last for several days, with some reporting symptoms such as vision, balance and concentration problems lasting for over a week. In all, it’s probably best that your nutmeg stays confined to your kitchen spice rack. Nog steeds geloof ik niet dat myristicine wordt omgezet in de lever tot MMDA. Wat ik niet wist is dat gezuiverde myristicine niet werkt, terwijl het als het nootmuskaat wel werkt. In de infograph geven ze de reden dat het de andere allylbenzenes moeten zijn, maar deze zouden eerst op een vergelijkbare manier moeten worden geactiveerd, dus net zo ongeloofwaardig.